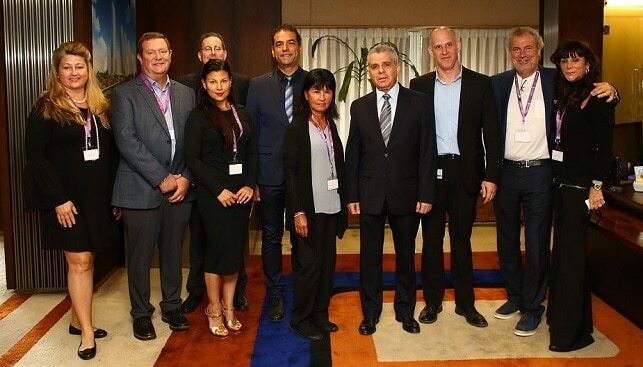 Ramat Gan, Israel, October 24, 2018: At the invitation of the Israel Diamond Exchange (IDE), Continental Buying Group (CBG) has brought its first buying mission to the Israeli bourse. CBG is the largest independent jewelry organization in the United States, representing over 100 of the most successful independent jewelers in the country. The 8-member delegation consisting of leading jewelers from Florida, Alabama, Tennesee and Ohio, is being led by Andie Weinman, CBG’s founder and CEO and Joe Murphy, COO. In order to give the buyers exposure to as many Israeli diamond suppliers as possible, their visit was timed to coincide with the Blue & White Fair, a marketplace for Israeli diamond suppliers and buyers on the bourse’s trading floor. Andie Weinman said that she hoped that this buying mission would be the first of many in Israel. “We visited the Israel Diamond Exchange earlier this year for the International Diamond Week in February and we were very impressed. We decided then that we would organize a pilot buying visit which is what we are doing now. Our hope is to hold buying missions to Israel twice a year, in October and March. IDE President Yoram Dvash said that he was thrilled by the connection with CBG. “This is one of the most important and influential organizations in the U.S. jewelry market. It provides us with direct access to large independent jewelers, a largely untapped market for Israeli diamond companies. We will do all we can to ensure that the cooperation continues,” he said.